On Friday, May 31st, 22 members joined us at the table to learn more from web developer, Bobbi Nagle, about HootSuite.com, a valuable virtual dashboard designed to help you manage your social media sites from one screen. Bobbie Nagle is director of Unicorn development. 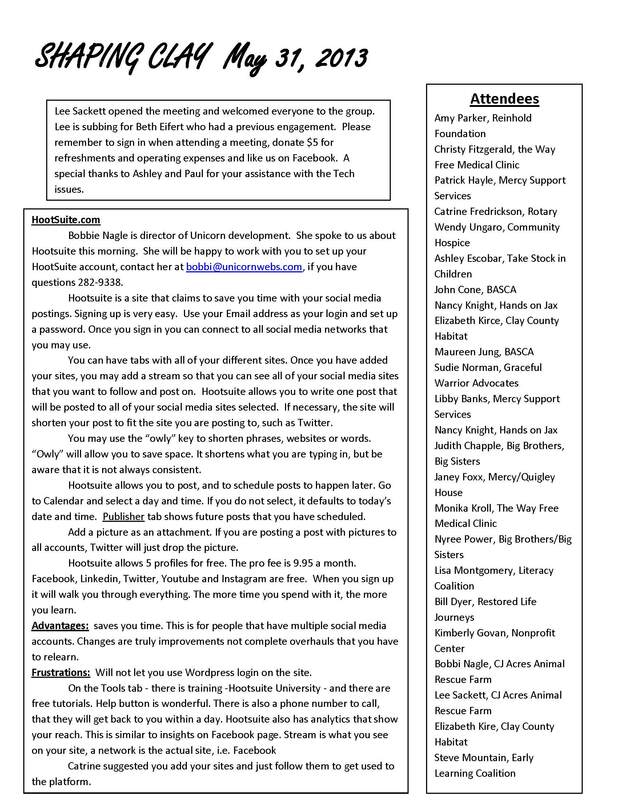 For the complete notes on her presentation about Hootsuite, click on the meeting notes link below. If you have further questions, she will be happy to work with you to set up your HootSuite account. Contact her at bobbi@unicornwebs.com or 282-9338. To view, print, or download the complete May Meeting Notes, click here. Nonprofit Center Resource Library is now online! Click here to view the library online and reserve a resource today! Nonprofit Sector Book Club! Interested in participating in a group discussion about Uncharitable by Dan Pallotta? Contact Jane Jordan for more details! NEW State of the Sector update! Click here to download the newest findings! Are you a nonprofit? Register to participate in the Give and Go! fundraising partnership! Taste of Clay: Thursday, June 20th, 5:30-8:00 pm., Club Continental. Please join Allegro and the Council on Aging for the 2013 annual Taste of Clay event. Tickets are $35 (or $30 for groups of 10+) and include wine tasting, hors d’oeuvres, live entertainment and much more! Clay County Habitat for Humanity Home Dedication celebrating the Oliver family, Friday, June 21, 2013 at noon; 159 Sesame Street; Middleburg, FL 32068. If you have an announcement, please write it in no more than 2 cut-and-paste-ready sentences, and send it to Beth Eifert AND Christy Fitzgerald.